Attending a food festival as a stallholder can be an exciting, if exhausting, experience. 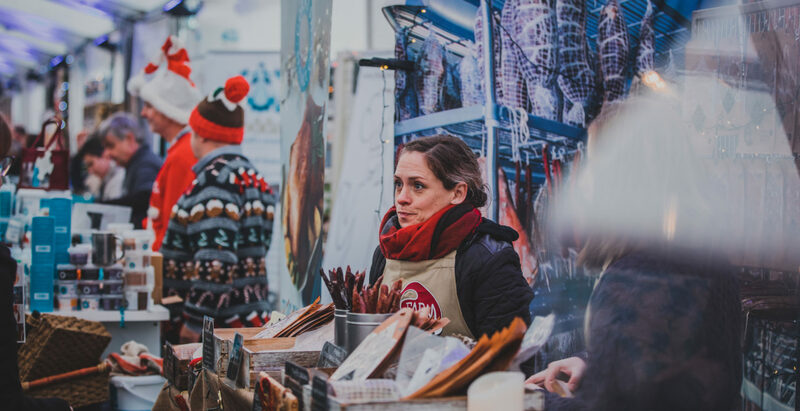 Having worked on trade stands, and helped with the organisation of Padstow Christmas Festival, Ellie shares her top tips on getting the most out of an event. In the weeks and days running up to the event, let your customers know that you are going to be there. Send out an email to your customer database, and make use of your social media following. Tag the event organisers, they might even share your post, and use the correct hashtags. Let everyone know where you will be; a stand number won’t necessarily be obvious to the general public, so explain where your stand is located. Make your stand as eye-catching as possible. Arrive with plenty of time to get your stand looking just right. If nothing else, invest in a pop up banner or two. Remember that if the festival is crowded, any signage below your table will not be seen, so make sure you have a banner or signage above/behind you as well. Have products at eye level, so shelves behind you, or a washing line with items hanging on it could work well. Have a clear price list so that customers don’t have to keep asking how much things are, and label items where appropriate. Have a working credit card machine to increase your sales (sales are often lost when customers don’t have enough cash) and plenty of change in your float. Everyone loves a deal, and it’s easy to up-sell with a special offer. Let customers know about your offer on social media before and during the event. It’s also a good opportunity to get rid of stock with a short shelf life. Engage with your customers by running a competition with an attractive prize. Use this as an opportunity to collect email addresses for future marketing mail shots. Make sure your data capture is GDPR compliant, either on paper or create a sign up form on an iPad. You will sell more if you offer free samples. If customers have a taster, they will be at your stand for a little longer, giving you an extra few seconds to try to sell your product. Be aware of allergies and hygiene. NB no double dipping! Have a (recycling) bin if you are using disposable spoons or mini plastic tasting cups. You will be on your feet for a long time, so make sure you are in comfy shoes, and pack a stool if there’s room for it. If you’re outside, or if the weather is cold, take some thick cardboard to stand on; it makes a huge difference. Take weather appropriate clothing – a thick coat, hat and fingerless gloves in winter, and suncream and a sun hat in the summer. You are selling your brand, so dress appropriately. If you don’t have any branded clothing, a branded apron is cost effective as it can be worn by anyone over any clothes. Remember to smile, be approachable, talk to people, explain your products, and share your knowledge. Don’t just sit there looking at your phone. Make eye contact, be friendly and polite. If you’re on your own, take refreshments so you don’t have to leave your stand. Make friends with your neighbouring stallholders and take turns to get coffee/pop to the loo. The last thing you want to do is sell out in the first two hours. In a perfect world you’ll sell your last cake in the last ten minutes of the festival, but judging how much stock you’ll need is tricky. You need enough to make your stand look good, but not so much that you’ll end up lugging it back to the van at the end of the day. Keep spare stock in the van, and failing that, take payment for orders and offer free postage to have them sent directly to your customer’s home. Depending on your product, you will need to have bags available for customers who have not brought their own. Plastic carrier bags are cheap, but unpopular; paper bags are smarter and can be easily branded. Hessian bags can be printed with your logo and sold alongside your products. Some customers might ask to leave their purchases with you while they browse – make sure to jot down their name and phone number in case they forget to come back for them. If you sell a heavy product then offer to have it sent to directly to the customer’s home to save them carrying it. However tired you are, don’t start to pack up until the event is officially over. It looks bad. Make it easy for your customers to buy more once they get home. Have some leaflets printed with background information on your business and product, including your website address and list of local stockists. Provide them with a special festival discount code to entice them back.